Fritattas are one of my favorite go-to dishes. Sometimes I make them when I’m feeling lazy and uninspired, and sometimes I plan the fritatta I’m going to eat for dinner when I wake up in the morning. 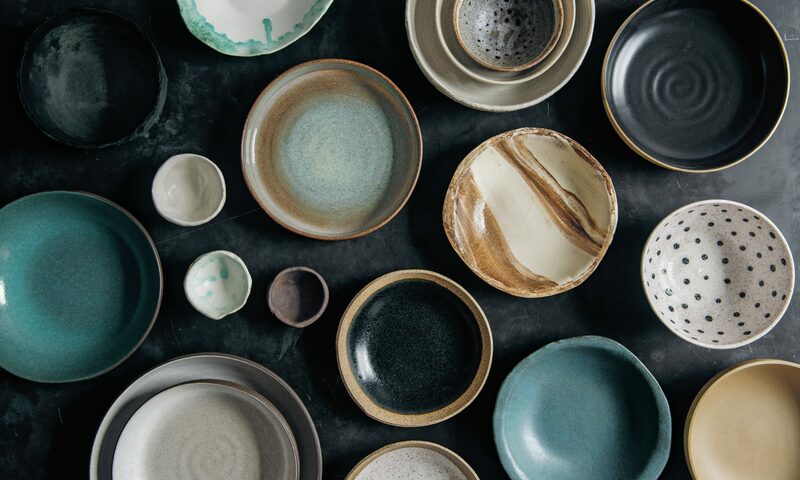 I like that they usually come together in 20 to 30 minutes, that you typically have a one-skillet dinner, and that you can plan on leftovers if there aren’t too many people eating that first night. If you’re unfamiliar, a fritatta is simply a flat, thick omelet, where the fillings are folded in with the eggs. It’s a relatively quick main dish to assemble, which makes it an obvious, low-effort weeknight option. But it also lends itself to dressing up. I’ve served fritattas at dinner parties, where they’re made a bit more elegant by a spoonful of roasted salsa, or something sweet like onion marmalade. Anything that you like to use to dress up your eggs will also dress up a fritatta. As I said, this one makes use of a few summer vegetables that have already been on rotation around here. It’s on the “business casual” end of dressed up, with an attractive layer of sliced tomatoes on top, but there’s a shortcut burst of flavor in a few spoonfuls of pesto. I had homemade on hand, but use whatever you find easiest. And you won’t be surprised to find that I grate my zucchini rather than slicing it into rounds—this is a method used in the Zucchini-Almond Burgers and those Summer Stuffed Peppers. I know, I could slice them up, salt the rounds, then blot off the moisture with a towel, but isn’t it just so much easier to do it this way? 2. Drain the zucchini and tomatoes: Grate the zucchini or yellow squash, using the large holes of a box grater, toss it with two big pinches of salt, and place in a fine-mesh colander or sieve. Let stand for 10 to 15 minutes then squeeze out the excess liquid by grabbing the zucchini in small handfuls. 3. 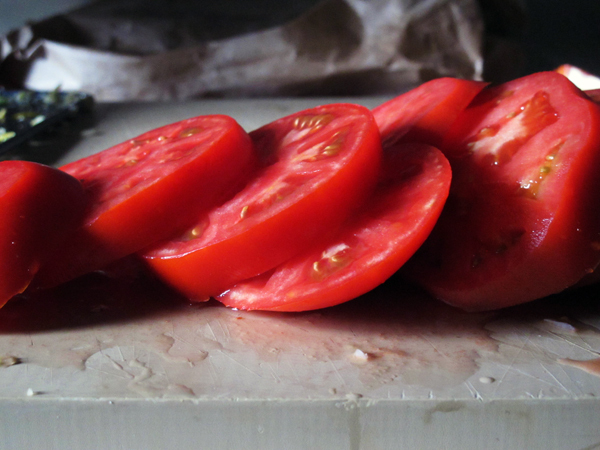 Lay the tomato slices in a single layer on a towel-lined plate or baking sheet and sprinkle with a pinch of salt. Flip them and sprinkle the other side. Let stand for 10 to 15 minutes to draw out excess moisture. 4. Heat 1 tablespoon olive oil in a 10-inch, oven-safe skillet (nonstick is great for this, too, and allows you to use less oil) over medium heat. Add the onion and cook until softened and beginning to brown, 8 to 10 minutes. Add the drained and squeezed-dry zucchini and cook for 2 or 3 minutes more, until tender. Let cool a bit while you prepare the eggs. 5. 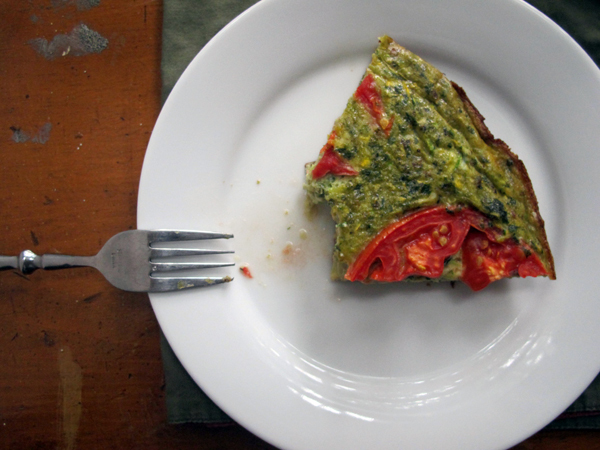 In a mixing bowl, whisk together the eggs, milk, pesto, pepper, and lemon zest. 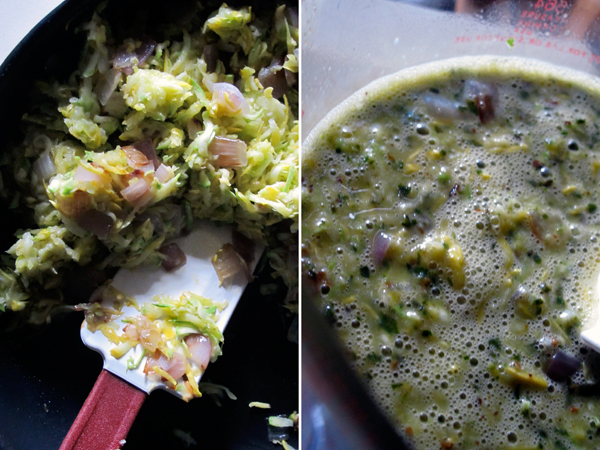 Quickly tip the zucchini-onion mixture into the eggs and stir to combine. 6. 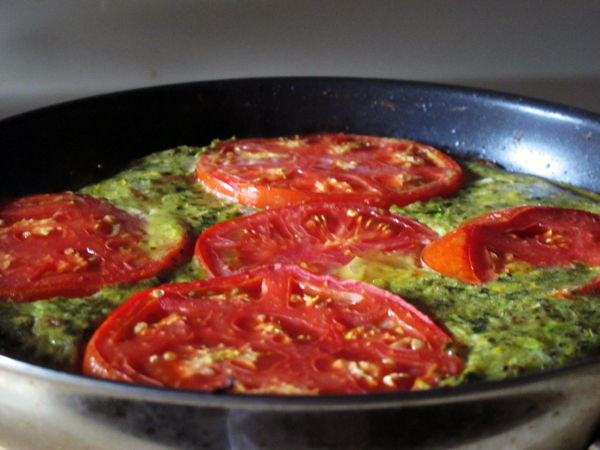 Return the skillet to the stovetop, add remaining 1 tablespoon oil, and turn the heat up to medium-high. When the oil is shimmering, pour in the eggs, scraping out everything from the bowl with a spatula. Let cook, undisturbed for a minute or two while the edges begin to cook. Run the spatula around the edge and then, slipping it underneath the fritatta, lift it slightly and tip the pan to let the uncooked eggs run underneath. 7. Once the fritatta is mostly set around the edges, after about 5 minutes, arrange the tomato slices on the top and transfer to the oven. Cook until set in the center, which will take 20 to 25 minutes. This is best served warm, but it can also be refrigerated and eaten cold. This was really good!! The zest of lemon was a surprise but made the dish – thanks! It really does zip everything into focus, doesn’t it?